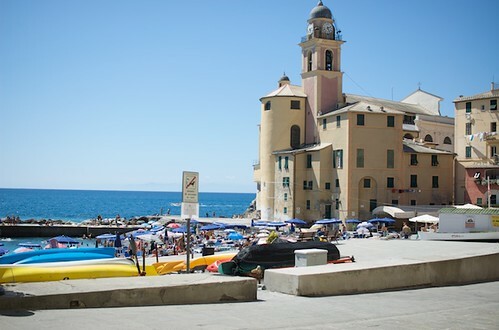 We found ourselves stopped in the small fishing village of Camogli for a few hours while driving up the Italian coast. Since it was between breakfast and lunch, and we didn’t want to eat too much for lunch, Will and I ended up noshing on a variety of focaccia, which must be the official bread in Liguria. 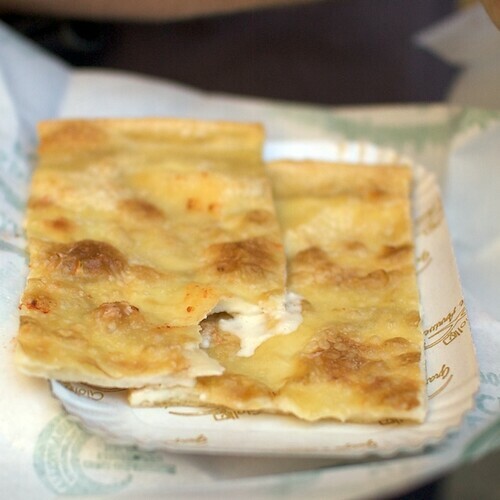 There was thin, delicate focaccia with a heavenly melted cheese in the center. The top layer of the focaccia was so thin that the cheese just oozed up over the top. 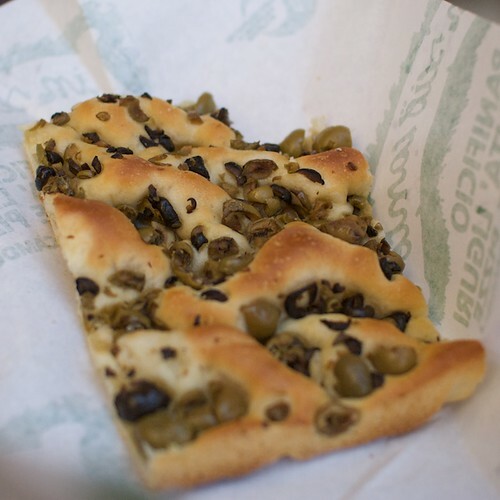 Then there was olive focaccia with good olives. 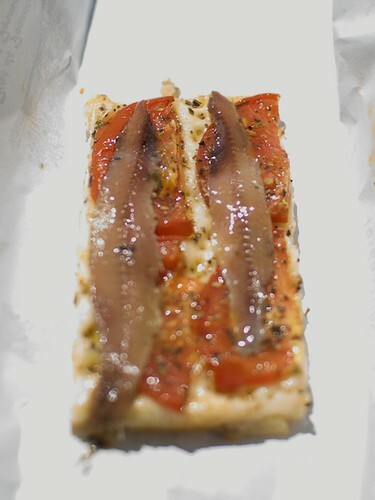 Then there was anchovies on tomato focaccia, which was full of savory saltiness. 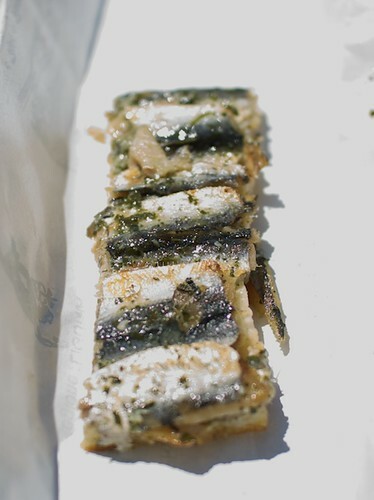 Then there was my favorite, fresh sardine focaccia, that tasted rich, oily, and reminded me of the sea. 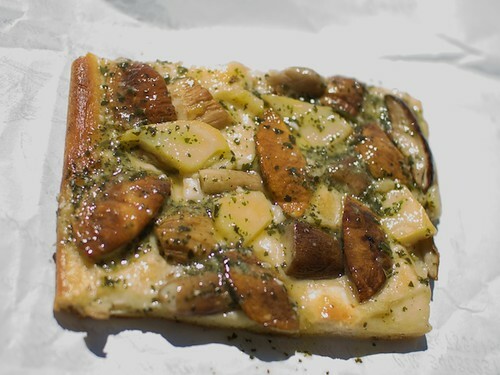 Then there was my second favorite, the porcini and potato focaccia. 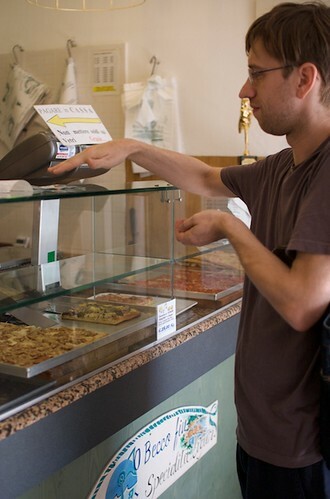 Will claimed that that slice of focaccia had as many porcini on it as he had in ten years prior to this. One of the best parts about stopping in at a focacceria is the no-nonsense of it. Point at the focaccia you want, indicate how big a slice you want, they cut it, weigh it, wrap it up in some paper, and give it to you to eat. Instant gratification. And you can hardly complain when you walk out of the bakery and you’re met with this view. The BF made dinner last night. Sliced tomatoes from an urban farm in Pasadena with a bit of olive oil and salt. 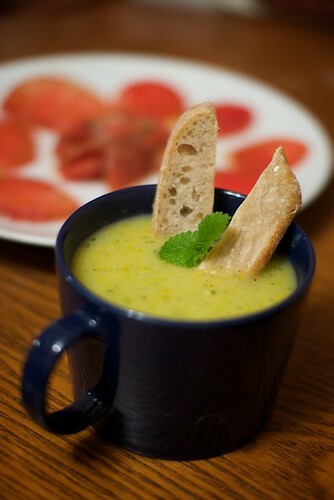 Squash and zucchini soup. I served the soup with some leftover ciabatta I baked yesterday. I’m going to be sad when summer is over and we no longer have delicious fresh tomatoes. 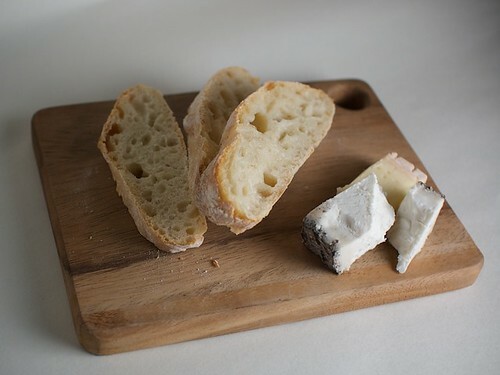 Fresh baked sourdough bread and some good, stinky cheese. Is there anything better than that to start off a morning? My sourdough starter is about a month old and it’s already got a nice tangy taste. It has pretty good leavening power too. I just wish I was better at making good looking bread as well as good tasting bread. The cheese is some blue goat cheese and some soft cheese from the Cheese Store in Silver Lake. I don’t know too much about cheeses other than what I like and don’t like, so I told the lady behind the counter to pick me a soft, un-mild, stinky cheese, and another cheese that’s kinda like Humboldt Fog. I’m happy with her choices even though I don’t remember what she picked out. 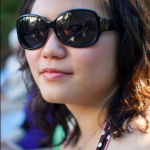 Since the weather has been getting warmer (finally!) I started making a pitcher of a refreshing summer drink just to have around in the fridge. The first pitcher I made was hibiscus (aka jamaica), ginger, and a little bit of sugar. This second pitcher I made was hibiscus, lemon balm, lemon verbena, and some pineapple mint. It still tastes strongly of hibiscus, but with a refreshing aftertaste thanks to the pineapple mint. The corner of my last iPhone case was cracked because of the 100 or so times I’ve dropped it. I’m glad it was the case that’s cracked and not the iPhone. I wasn’t planning on getting a new case, but I saw this one today and I couldn’t say no. 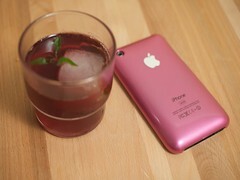 It looks exactly like the back of my iPhone, except it’s pink! How can I say no to that? It doesn’t have as much coverage in the front as I’d like, but maybe that’ll teach me to be more careful with my phone.